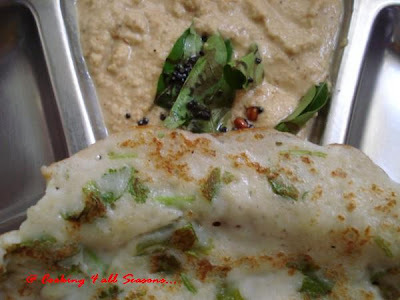 Cooking 4 all Seasons: Aloo Dosa or Potato Dosa and Mini Dosas ~ 101 Dosa Varieties! Well, its going to be exactly one more week for the mela deadline and I am actually wondering if I will be able to cook and post all the different dosas that I had planned. It was going to be 3 dosa posts every week, but I find quite hard. Coming to the varieties, I am yet to get most of the planned ones. But I wanted to get those requested ones to be on the list, atleast! Nirmala suggested I make one Paneer B.Masala Dosa and I replied that I planned for it too. But I am yet to get that done. Just last evening I made Paneer B Masala, after a week's pester from Konda. I still have some left in the fridge. Though I try never store anything for second serving, this is one exceptional dish, pun intended! The other day, hubby said I should try storing shop made Paneer, as I get this requested at odd times. So I had gone to Nilgiris and got two chunks of Paneer. I remember Amma using this often. I used to be like Konda, so when Amma couldn't make home made, she used to use these. While I was riding back home, I was thinking about the different varieties that I can come up. The ideas were flowing at amazing speed and I was actually upset that I didn't have a pen to jot them down!. I wonder why I never could think much on rocket science or something else! How can I, when all I can imagine, is revolving around food! Anyway, I planned on some varieties with paneer, hope I come up with them on time! Coming back to this topic on hand, once upon a time, while I was on my search for something, I stumbled on something called Aloo or Potato Dosa. At first shot, I thought it was the regular Masala dosa. But I was wrong, on further investigation, to my surprise, I saw the potatoes being added to the batter. Now that's a great idea right. I have been planning to make that one for a long time. 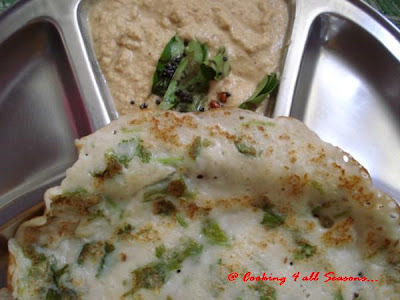 When I had to plan for the breakfast one morning, I thought Potato Dosa makes the perfect solutions for both the needs! This is instant and works out perfect for a quick dosa cravings! Though this may not sound very healthy for grown ups, this is great for growing up kids. I am always finding ways to include carbs to my daughter's diet. So this works out fine. Boil the potatoes to soft. Potatoes get cooked well if you cut them into half and pressure cook. Once done, let it cool, then peel, mash and keep that aside. I used pav bajji masher but any dal masher also will do. Just make sure there are no chunks. In a bowl, take the rice flour, curds, Green chillies, Cumin seeds, Coriander leaves and salt. Mix well. Then add the mashed potatoes and sufficient water to achieve a dosa like consistency. Using your hands, mix well to ensure no lumps are formed. If you have a blender, you can blend the flour with mashed potatoes with water and then add the rest of the ingredients. Now we are set to make the dosas! 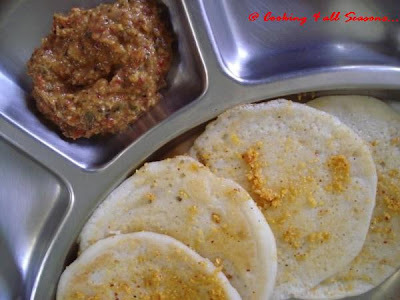 Heat a tawa, smear oil and once the pan is hot, pour a ladleful of batter in the center and spread like the regular dosa. If this doesn't work out, you can drop in circle, then try to make a dosa from it. Get the flame to medium, so that it gets cooked well. If its not cooked fully, you will not be able to flip it to the other side. So sprinkle oil and wait till its cooked well. Then flip to the other side and cook its done. This goes well with coconut or ground nut chutney. Even Podi will be great. Mini Dosa ~ Beauty comes in small size! 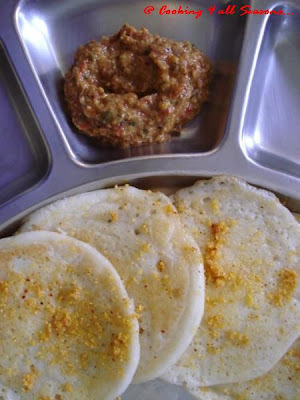 Well there is no recipe as such for these, just a trick to make kids eat the dosa. Konda, though a dosa lover, still has problems eating it herself. So I find myself trying very hard to make her to eat them herself. If she is eating on her own, its got to be crispy dosa. No soft ones for her, you know!. And you can't get crispy dosa just like that right. So I was toying with the idea of making things interesting for her. I have always seen these mini dosas, mostly in the parties where dosas are on the menu. Dad is a great host and he goes to great extent to ensure the menu is catered to the invitees personal preference too. But whatever party he is hosting, he always ensures he arranges for the dosa master, to prepare hot dosas for the guest. We, south indians eat dosas almost everyday at home. Yet, these hot dosas never fail to attract the crowd. In most parties, where the dosa master is ready with his batter ready, you will find a big queue, waiting patiently for their hot dosas. Such is our love for these lovely crapes! Its always so amazing to find these people at work. They have this big tawa burning constantly and they take the batter with a cup and swoosh they do and you find yourself staring at the most delicious looking dosas, getting cooked. It comes out so thin and crisp. They do these swoosh some four to five times and take a ladleful of oil and just pour on top. You have four to five dosas getting ready at the same time. It gets cooked in flat 2 mins. Most times, they don't even flip to the other side. One warning though, if you are not very attentive, your dosas will disappear, right in front of your eyes! On request, they do these small dosas also, this takes a little longer to get cooked, still its a piece of art to watch these being made. I was wondering it must be great to have these mini dosas done at home, I just took a spoon of batter and just poured on the hot tawa. You should not spread it, but rather allow it to get settled by itself. The batter should not be thick, it will spread on itself if its little thin. Sprinkle some oil, cover with a lid. Cook for a min, flip to the other side if you want.Voila! your mini dosas are ready! I smeared podi and ghee over it and served with urad dal tomato chutney. As expected, my daughter was trilled to see these cute little ones. Kids are so amazing, they find pleasure in such small ones, literally! Seeing her reaction, I remembered an incident that happened during our trip to my parents place. Dad took us for shopping and he got her so many things. She was happy but on seeing some pens, she insisted that he buy her those too. I refused saying she is going to break them in no time. He, anyway got them for her. She was so trilled and excited on having them. We were surprised that she was so very happy on getting those inexpensive pens. Dad said how wonderful it is, that we can please a child with such small things. It is true indeed! Aloo dosas and Mini Dosas are ready to join the Mela! With that I take leave, with a gentle reminder that, its just a week left for all those of you, who want to indulge in dosa love! Of course, it doesn't stop with the deadline, but we want to be prompt, dont'we?